BERLIN — European intelligence chiefs warned Monday that Russia is actively seeking to undermine their democracies by disinformation, cyberattacks and more traditional means of espionage. The heads of Britain and Germany’s domestic intelligence agencies, as well as the European Union and NATO’s top security officials, pinpointed Moscow as the prime source of hybrid threats to Europe, citing attempts to manipulate elections, steal sensitive data and spark a coup in Montenegro. They also cited the nerve agent attack against a former Russian spy in Britain this year that Britain has blamed on Russia. “Our respect for Russia’s people ... cannot and must not stop us from calling out and pushing back on the Kremlin’s flagrant breaches of international rules,” the head of Britain’s MI5 spy agency, Andrew Parker, told an intelligence gathering in Berlin. Parker said the March 4 attack on Sergei Skripal and his daughter in Salisbury was swiftly followed by Russian attempts to divert blame. That resulted in at least 30 alternative theories about the attack being spread by Russian authorities and media. “Whatever nonsense they conjure up, the case is clear,” said Parker. Germany’s domestic intelligence chief, Hans-Georg Maassen, said his agency, known as BfV, blames Russian authorities for orchestrating a persistent cyberattack aimed at stealing sensitive data so it can be used in future intelligence campaigns, such as what happened with the Democratic National Committee emails leaked during the 2016 U.S. presidential election campaign. Maassen said authorities are particularly concerned about the possible funding of extremist groups aiming to divide European societies, and he called for greater awareness of hybrid attacks to counter such threats. Sir Julian King, the EU’s security commissioner, warned that social media had “turbocharged” state actors’ ability to spread disinformation, citing the recent revelations about Cambridge Analytica’s gathering of personal data from Facebook users to help manipulate elections. King warned of future threats posed by sophisticated fake videos that are undiscernible from real footage, calling it an example of a “deadly weapon of mass disinformation” that societies need to find ways of becoming resilient to. He also said the European Commission is working with social media companies such as Facebook and Twitter to better inform users about why they are seeing certain posts and who is paying for them, to help protect against disinformation campaigns by groups or governments outside the country. NATO’s assistant secretary general for intelligence and security, Arndt Freytag von Loringhoven, said the price of launching hybrid attacks needs to increase, citing the expulsion of 150 undeclared spies by Britain and its allies in the wake of the Salisbury attack. Intelligence chiefs also noted the continued threat posed by Islamist extremism and the need to cooperate closely among European agencies, despite Britain’s departure from the EU next year. Parker, whose speech in Berlin was the first by a serving MI5 director outside Britain, said security agencies had thwarted 12 terrorist plots in the U.K. since Parliament was attacked in March 2017. “We remain unwaveringly and absolutely committed to working together with European partners,” he said, calling for security cooperation to be enshrined in future treaties between Britain and the EU. He declined to say whether MI5 had registered any attempts at influencing the outcome. 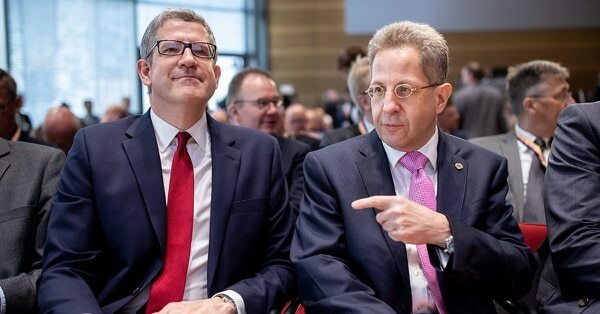 Maassen, his German counterpart, said the Brexit referendum likely prompted spy chief in some countries “to nearly laugh their heads off” because it suited their interests.